Today I'm going to give something new a shot, so let me know if you like this in the comments, and I can do more in the future. 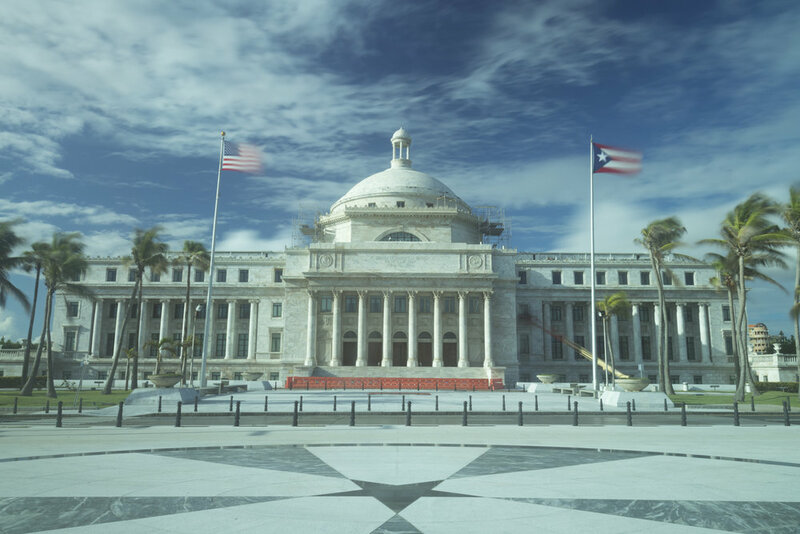 I'm going to go through the entire process of creating my photograph the Puerto Rican Capitol building: from how I found the location, to how I created the photograph, to how I edited it. Through doing this I hope to share more of the full process, and inspire you to go out and create something exciting! Recently I have been watching a lot of the photographer Brendan Van Son on Youtube. He shoots capitol buildings in a particular fashion, and when I saw the Puerto Rico capitol I was inspired to give it a try. The second day I was in Puerto Rico I was getting a ride to Old San Juan to meet some people for dinner. As we headed down the road I saw the Capitolio, a beautiful white marble building. I was struck, and I started to formulate my plan. A few days later I took my first walk along the water to Old San Juan, ready to create the photograph I had forming in mind. I arrived at the capitol mid morning, the sun already overhead and quiet harsh. Out front of the capitol were a number of tour buses that were offloading their passengers. I didn't really want them all in the photo, but I had an idea to help. First though, I needed to find my composition. Across the road from the capitolio is a small plaza, Plaza San Juan Bautista, that offered a good view of the building facade, as well as the US and Puerto Rican flags flying high. There is a statue of Saint John at the rear of the plaza, and a star detail in the center. The Statue was interesting, but it would have been hard to use it as a focal point. It faces the capitol so I would have photographed it's back, plus the statue is quite large; it would have covered up the capitol building. The star on the other hand, was a great point of interest. It has arms that radiate out from it's five points, two of which point towards the building making for good leading lines. Everything about the setting worked with a symmetrical composition, which created a balanced image. With the elements in place, It was time to set up my shot. I centered myself behind the star, and began to pull out my gear. I used my Canon 16-35mm F/4L set as wide as it would go to fit the entire building. To help blur out the people, and to create a sense of dynamic movement in the clouds and flags, I wanted a long exposure. To do this I set the ISO to 100 and the aperture to F/11. I also used a 9 stop neutral density filter which let me take a longer exposure then I could have otherwise. In the end I had a shutter speed of 8 seconds. There was a tour group behind me, so I felt an internal pressure to be quick. I finished setting up my tripod, arranged the composition, and hit the button on my remote shutter release (which I use to reduce the likelihood of moving the camera when I press the shutter button). When the exposure finished, I previewed the photograph. It looked alright! I didn't care for the buses, and you could still see some of the people, but I decided it was good enough and packed up. If I had taken the time to really evaluate the photo I would have realized I had made a grave mistake: I forgot to focus! When I finally realized the mistake I had made, I knew I would have to go back and try again. The next week I took an Uber back early in the morning. This time the sun was still low in the sky, casting nice light across the building, and there were no tour buses. There were big orange barricades in front of the building though, as well as a boom lift with two guys working on the facade. I didn't think I would get a better chance for the photo, so I decided to go ahead with the shoot. I had learned from my previous shot, and made a few adjustments to the composition. I actually included the star on the ground in the plaza, and I made sure to focus! This time my settings were ISO 100, F/16, with a shutter of 20 seconds. This is not a blog about learning Lightroom, but editing is and always has been a big part of photography. That said, I am not going to give a play by play on my editing process, but I will elucidate the steps I took to create the final image. As you may have noticed, the filter I used gave the photo a weird color cast. My first step was to correct this in photoshop. Here is a link to the tutorial I used to learn how to do this. It has been an invaluable process to know! After making the corrections, I brought the image back into lightroom where I began to make my edits. I don't like to change things too much, but I do have a look I aim for while editing. To do this, I set the white balance for daylight, fiddle with the highlights and shadows, and make sure the blacks and whites are accurate. I don't touch the contrast slider, but I do add a specific tone curve to create a somewhat film-like look. The biggest changes I made are too the colors. I reduced the saturation and increased the vibrancy, which gives my photographs a muted but natural appearance that I like. I also adjust the color channel sliders; I increased the yellow saturation to bring some color back into the sunrise light. Finally, I added clarity and sharpening to make the image pop. Below is a comparison between the original photo, and the final. Through this blog I have shared my creative process, and taken you from first inspiration to a final image. Despite shooting a highly photographed location, and a few set backs, I still created what I consider to be a unique image. If you take nothing else away from this post, I hope you remember this: having a vision for your photograph is only the first step. You need to keep at it, and try as many times as you need to until you create the image you imagined.